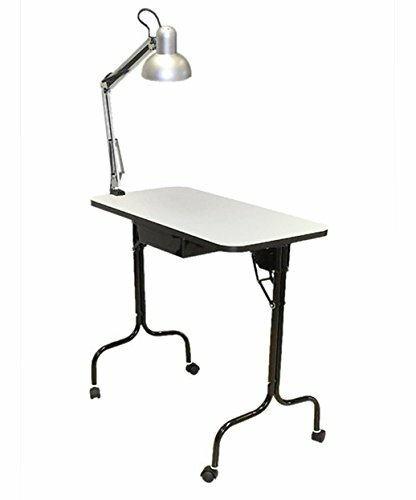 Save space in tight areas with the Pibbs 974 Manicure Table Fold Legs with Lamp. Add working space in a snap with this portable manicure table and extendable arm lamp. Standing 29 inches high with a 31-inch long by 16-inch wide working surface, this rolling table includes a storage drawer for tools and supplies. Fold up the table's legs to tuck it away when not in use, or roll elsewhere with its four casters. Each box contains one folding/rolling table with a lamp. This unit includes a 1-year warranty. Add working space in a snap with this portable manicure table and extendable arm lamp. Standing 29 inches high with a 31-inch long by 16-inch wide working surface, this rolling table includes a storage drawer for tools and supplies. Fold up the table's legs to tuck it away when not in use, or roll elsewhere with its four casters. Each box contains one folding/rolling table with a lamp. This unit includes a 1-year warranty. If you have any questions about this product by Pibbs, contact us by completing and submitting the form below. If you are looking for a specif part number, please include it with your message.